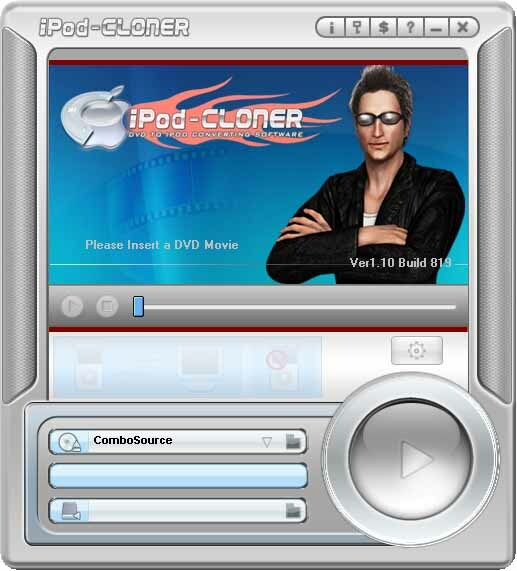 iPod-Cloner is a one-click solution to convert all kinds of DVD to iPod compatible format. The conversion process is fast and easy. Its built-in iPod Files Manager allows you to transport all files, including music, video, movies and TV shows directly from PC to iPod. It directly transports DVD files from PC to iPod without iTunes! Converts DVD to iPod MP4 (MPEG-4), Xvid, H264, MP3, AAC, M4A formats. Supports the conversion of latest DVD movies. iPod-Cloner can convert all kinds of DVD to iPod compatible format easily. * Easily transports all the files, including music, video, movies and TV shows from your computer to iPod. Save entire website to your hard disk for efficient view. It transfers your music to your hard disk for safe keeping. Transfer your music and video between iPod. Backup iPod playlists with ratings and trackcount informations in one clic. Qweas is providing links to iPod-Cloner 1.80 as a courtesy, and makes no representations regarding iPod-Cloner or any other applications or any information related thereto. Any questions, complaints or claims regarding this application iPod-Cloner 1.80 must be directed to the appropriate software vendor. You may click the publisher link of iPod-Cloner on the top of this page to get more details about the vendor.